UPDATE: Early Bird Biscuit Co. opened Monday, March 28 to the anticipated overwhelming response. You'll find the bakery at 119 N. Robinson St., and its hours are Tuesdays-Fridays from 7 a.m.-2 p.m. and Saturdays from 7 a.m.-noon. 12-16-2015: Fan residents, there’s exciting news for you — if you’re a biscuit lover. And that’s just everybody, I’m confident in saying. Early Bird Biscuit Co. is moving from its home in Lakeside to the Fan on March 1, according to owner Tim Laxton. “If you’ve been in our space on Lakeside,” he says, “you know that you pretty much have to go outside to change your mind.” The challenge of that small space meant that Laxton was limited in what he could offer customers. He started looking for a more expansive location where he could serve a portable breakfast on a biscuit — something folks have been clamoring for since he opened the bakery two years ago. With partner Blanchard’s Roasting Co., the new Early Bird will offer a full barista service. Laxton plans a decor that’s reminiscent of the 1930s and ’40s. And he’ll have room to display his collections of butter churns, early appliances and other period pieces. “There will be cool music and nods to my Appalachian roots,” he says. One thing Richmond lacks — rooftop bars. Quirk Hotel has one slated and so does the Hofheimer Building at 2816 W. Broad Street, the old Adams Camera space. You may remember that this past year Peter Chang disclosed plans to open another of his restaurants in the building in 2016. The rooftop space won’t be a bar — exactly. 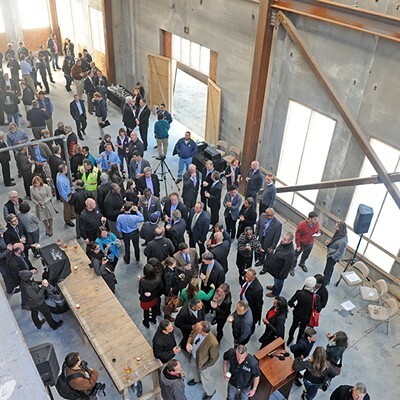 Snipes Properties, which owns the building, just announced that Mosaic Catering and Events will manage the rooftop, and along with a larger space on the second floor and a small art gallery, the whole shebang will be available for weddings, parties and other events. Mosaic can handle any catering but the company won’t restrict folks to their services. It’s a spectacular view, and Snipes said in a press release that the planning and construction process took over a year, and received zoning approval from City Council in November. Both Chang’s restaurant and the event space will open in the spring. But we all do, right? It’s hard not to succumb to cupcakes, but Carytown Cupcakes, at 3111 W. Cary St., is making it even more difficult to resist them. After transforming into Hogwarts with a selection of Harry Potter-themed cupcakes for Halloween, the bakery is now channeling an enormous amount of the Force to celebrate the latest Star Wars epic, "The Force Awakens" from Dec. 17-31. First, the cupcakes: The Wookie Cookie (a vegan brown sugar cupcake with cookie dough filling), Darth Vader (a black velvet cupcake with black-tinted chocolate buttercream), Stormtrooper Sandie (a cream cheese pecan cupcake), Imperial Stout (a chocolate stout beer cupcake topped with meringue icing), Thai Coffee Fighter (a cardamom-spiced coffee cupcake) and the Princess Leia. The last one is a gluten-free cinnamon cupcake brushed with cinnamon glaze. They love everybody at that shop. Pick, choose, eat all six. How often does a Stars Wars movie come around, after all? And to get in the mood for the big premier, Carytown Cupcakes will be decked out with decorations and will welcome visiting characters. R2D2 will be there, of course, but personally, I’ll have to pay a special visit to my old friend Han Solo -- frozen in carbonite. Besides trivia and board game nights, the bakery will be host to the Richmond Cello Orchestra, which will perform the series’ memorable score Dec. 20 and 27 from 1:30-4:30 p.m.
For details -- and you need to know all of them -- visit carytown-cupcakes.com. Frankenfish: Farmed genetically modified salmon may have been cleared by the federal government for American consumption, but Ellwood Thompson’s Local Market announced last week that it won’t be selling it. It’s joined by larger retailers such as Aldi, Costco, Kroger, Trader Joe’s, Target and Whole Foods. Target sells salmon? Maybe Someday: Tazza Kitchen and Virginia Beach’s Taste Unlimited may open in the Westhampton Theater’s space after the new owners finish the building’s renovation. The theater will close this summer. Openings: Shawn Minter and Tamica Epps, co-owners of Shockoe Whiskey & Wine and Loft 17, will open another spot, Shockoe Steakhouse, at 14 N. 18th St., in January. … Chris LaTora, the owner of Midlothian’s Mulligan’s Sports Grille, now closed, will open a new restaurant in Chester, reports Richmond BizSense. … According to The Richmond Times-Dispatch, Eat Restaurant Partners is planning a sushi and steakhouse to open next year in Short Pump’s Greengate development. Closed: Strawberry Thai announced on its Facebook page that it would close immediately due to financial difficulties. Happenings: You can help out a homeless — and very cute — beagle named Walden and learn how to paint at Carytown Cupcakes and a Toast to Canvas’ Paint Your Pet event on Wednesday, Dec. 16, at 5:30 p.m. Tickets are $48, of which $18 will go to benefit Walden. For tickets and details, visit atoasttocanvas.com. … You can celebrate the season in your own way at Strangeways Brewing’s monthly Brews and Burlesque night with Those Freaking Weirdos’ cabaret on Friday, Dec. 11, at 9 p.m. For tickets, visit tfwburlesque.com. It will be the third location for the brewery. The number of breweries in Richmond just jumped again — or it will in April when the Charlottesville-based Three Notch’d Brewing Co. opens its third location in Scott’s Addition, reports Richmond BizSense. The building at 2930 W. Broad St. will also house the second location of Gather, a co-working space. Members pay a monthly fee that includes desks, offices or conference rooms, plus other things such as wifi and video conferencing equipment. Three Notch’d takes its name from the road that led from Richmond to Charlottesville, which was marked by the three notches colonists used to blaze a trail that may have been created by Native Americans long before they arrived. We know the trail as Three Chopt Road here in Richmond, and Route 250 more or less follows its same path to Charlottesville. 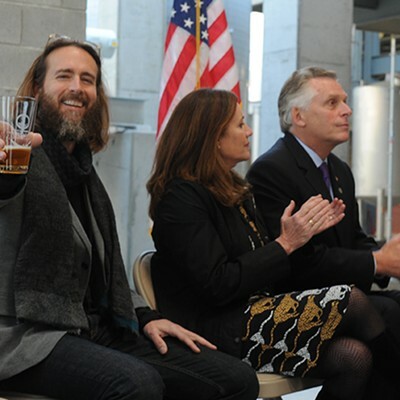 Co-owner Scott Roth told BizSense that the brewery has plans to open more tasting rooms throughout Virginia. On its Facebook page, Three Notch’d announced that its looking for a head brewer and taproom manager for the Richmond location. It’s a confusing issue, the labeling of genetically modified foods. And The New York Times spoke to Richmond chef Joe Sparatta, co-owner of Heritage and Southbound, about it. “‘Guests ask about everything,’ Mr. Sparatta said. ‘Is there dairy in this? Is this fish wild or farmed? What are your animals eating? We try to source as much as we can locally, which helps us know more about the products we use, but we can’t get everything from around here,’” Sparatta is quoted as saying. Right now there’s no federal requirement to label food as genetically modified , although about 34,000 products are labeled voluntarily with the Non-GMO Project’s seal, reports the Times. Recently, the issue seems to have ignited anti-GMO sentiment in a way that it hadn’t before. In November, the FDA approved the sale of genetically modified salmon — the fish grow twice as fast as conventionally farmed salmon. Companies large and small have stated that they will not carry the new product. Here’s a link to the Times article and if you’d like to read more about the issue, The New Yorker has an in-depth article up on its site. Critically acclaimed chef Ian Boden of the Shack in Staunton has had a difficult time finding a new sous chef. Although it’s been tough, the one tiny upside is that it’s freed up space in his kitchen for a series of visiting chefs with which to collaborate each weekend. Heritage and Southbound’s Joe Sparatta was Boden’s first guest earlier this fall and now Travis Milton, formerly of Comfort and planning to open his own restaurant, Shovel & Pick, in 2016, is paying a visit on Friday and Saturday, Dec. 11-12. It's a cooking dream team and reservations go fast at the Shack for these events — Staunton is less than two hours away, so expect a few Richmonders to make the trip. You can call (540) 490-1961 for more details. The smell of hops wafted into the cold fall air from glasses filled with Stone Brewing Co.’s amber colored I.P.A., as Gov. 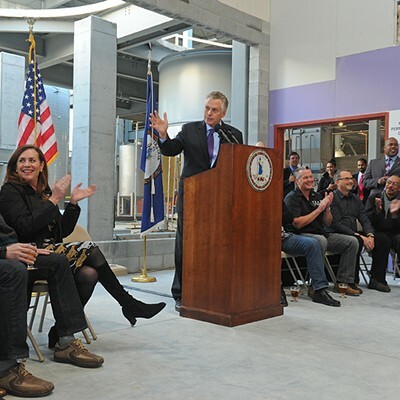 McAuliffe toasted progress today at the craft brewer’s new facility. 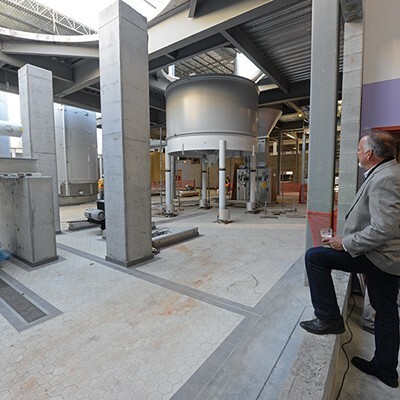 Stone, city and state officials gathered inside the over 200,000 square foot behemoth that towers over Fulton Hill, to celebrate the arrival of its new brew house and the installation of the brewing system.The roof had to be removed for the large brew house tanks to be placed. 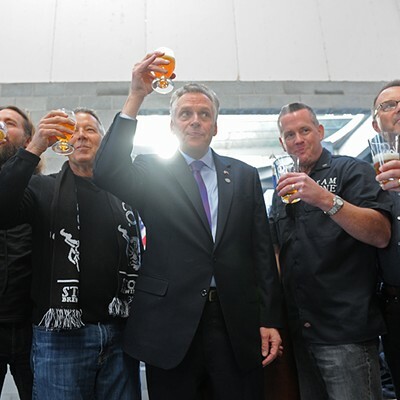 McAuliffe said that Stone boosts Virginia’s profile as a craft beer friendly state. 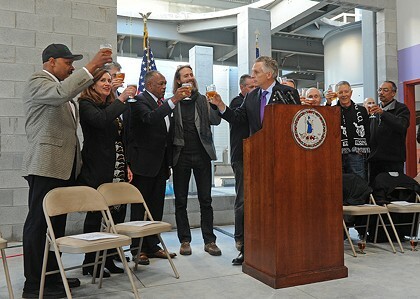 Beer in hand and with a hearty laugh, McAuliffe joked that Stone officials should move their entire operation from San Diego to Richmond. 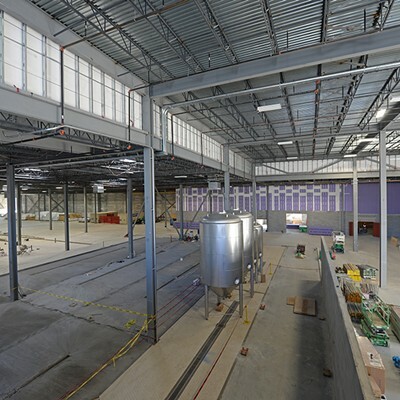 The brewery is expected to be operational in May and is part of an over $74 million project that includes a packaging hall, restaurant, retail and offices. Stone expects to employ over 288 people. The “Stone Brewing World Bistro & Gardens” restaurant is planned for the Intermediate Terminal Building, located on the river adjacent to concrete slab known as the Sugar Pad. It’s expected to open a year or two after that. Stone is part of an overhaul envisioned by the city, of the riverfront along East Main Street. 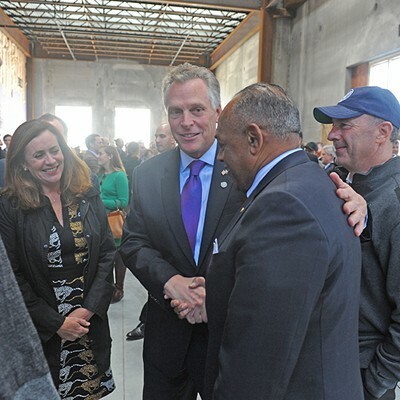 A park is planned for the Sugar Pad that would also include a beer garden for Stone’s restaurant, a promenade, bicycle amenities for the Virginia Capital Trail, tidal pools and an event lawn. The city hasn’t given cost estimates for the project and says that it will hold community input meetings to craft exactly how the site will look. Patrick Tiernan, Stone chief operating officer, said that state and city officials worked well with Stone to bring the brewery to Richmond. "You’ve done what you have said … You’ve given me clarity,” he said. 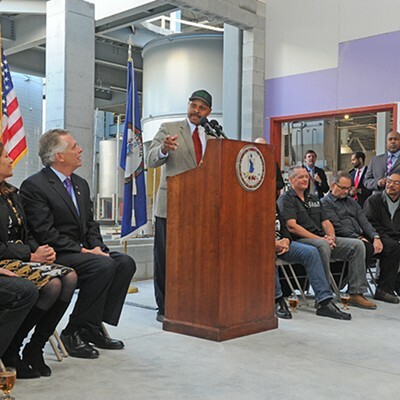 The brewery will be one on a long list in Virginia, which is home to over 130. 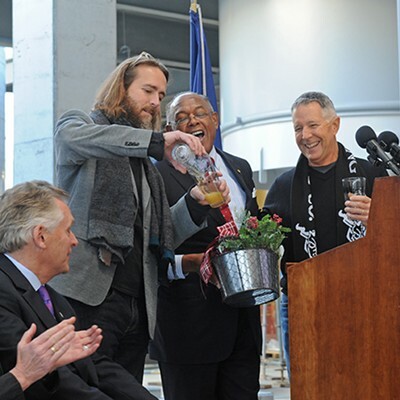 He said that the state has embraced other craft spirits with its 270 wineries, 40 distilleries and 10 cideries. Mayor Dwight C. Jones said that the project was a big win for the Fulton Hill neighborhood. Jones pointed out that Richmond beat out 28 states and over 300 locations to be home for the facility. Tickets are $75 and include signed copy of Voltaggio’s book. Drinks, tax and gratuity aren’t included. Call the Shops at Willow Lawn’s Family Meal at 447-1879 for more information. On the move: Secco Wine Bar announced that it would move from its Carytown location to 325 N. Robinson St., otherwise known as the old Buddy’s Place, in 2016. Pasture’s presents: Through Dec. 7, Pasture will hold a drive to collect necessities, toys, games and books for children in foster care in conjunction with Connecting Hearts in Virginia and Faces of Virginia Families. Call 780-0416 for details. Expanding choices: With the conversion of downtown’s Hilton Garden Inn to a full-fledged Hilton Hotel, its Garden Grill has been renamed Herb N’ Kitchen and now serves breakfast, lunch and dinner. New home: Midlothian’s Inter China Restaurant has moved to a new location in the Courthouse Place shopping center at 11512 Busy St., the Times-Dispatch reports. Barbecue is back: Deep Run Roadhouse is opening its second restaurant in the old Moo Burgers space on Laurel Street near Virginia Commonwealth University. Sugar high: Baker Maria Onsel took a break, but according to RVA News you can now find Hispania Bakery’s South American pastries and other delectable goods at Union Market and Little House Green Grocery. CORRECTION: This article incorrectly named Hispania Bakery as Espana Bakery.